The Golden State Warriors have won back-to-back NBA titles. During the offseason, the team improved to say the least with the addition of DeMarcus Cousins. The Minnesota Timberwolves have agreed to a two-year deal with James Nunnally, according to Yahoo Sports’ Shams Charania. The deal is for the veteran’s minimum and includes partial guarantees, per The Athletic’s Jon Krawczynski. Nunnally spent the last two seasons starring for Turkey’s Fenerbahçe. Showing flashes of superstar potential, Jayson Tatum was just a revelation for the Boston Celtics as a rookie last season. Tatum was so exceptional that he finished the season with averages of 13.9 points and five rebounds, which earned him All-Rookie First Team honors. Since Tatum played so well as a rookie, Celtics coach Brad Stevens is quite excited about the forward’s potential and looking forward to him taking the next step. And to ensure that Tatum takes that next step, Stevens and the Celtics are making sure that the 20-year-old spends the offseason improving his core strength. As Brad Stevens approaches this season with the Celtics team he thought he would have a year ago, there’s one thing he’s not going to do with potential 2019 free agent Kyrie Irving, and that’s look a year ahead. 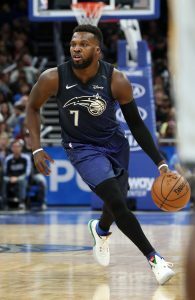 Memphis Grizzlies will sign free agent point guard Shelvin Mack to a one-year contract, league sources tell Adrian Wojnarowski of ESPN.com (Twitter link). Wojnarowski first reported about two and a half weeks ago that the two sides were discussing a one-year deal. Mack, who inked a two-year contract with Orlando in 2017, appeared in 69 games for the Magic last season, averaging 6.9 PPG, 3.9 APG, and 2.4 RPG in a backup point guard role. His salary for 2018/19 only included a small partial guarantee though, so the Magic waived him last month before they were on the hook for the full amount. By signing Mack, the Grizzlies will add some veteran stability to their point guard depth chart behind Mike Conley, who is coming off a major foot injury. Andrew Harrison and Jevon Carter are Memphis’ other point guards, with Kobi Simmons also in the mix on a two-way deal. Memphis doesn’t have its bi-annual exception available this season and already used its full mid-level exception on Kyle Anderson, so Mack will receive a minimum-salary deal, which will keep the Grizzlies’ team salary just below the tax line. Assuming Mack’s contract is guaranteed, it’ll be the 15th guaranteed deal on the team’s books, plus Harrison’s non-guaranteed salary. The Grizzlies will have to trade or release at least one player before the regular season begins, with Harrison and Dakari Johnson among those most at risk. The Denver Nuggets have officially signed Akoon-Purcell to a contract. Akoon-Purcell averaged 12.0 PPG, 2.0 RPG, 1.5 APG and 2.0 SPG in 19.3 MPG over four Las Vegas summer league contests with Denver. He played the last two years with the Bakken Bears in the Danish league, averaging 17.3 PPG, 4.9 RPG and 3.8 APG last season. The 6’5” Akoon-Purcell went undrafted in 2016 after playing at Illinois State. As a senior, he averaged 14.9 PPG, 4.9 RPG and 1.9 APG. The NBA will be returning to Mexico City once again during the 2018/19 regular season, with the Magic set to play the Bulls and Jazz at the Arena Ciudad de Mexico on December 13 and December 15, respectively. Orlando announced the news today in a press release.The NBA projects to continue playing two games per year in Mexico City through at least the 2020/21 season, according to Orlando’s press release. This year’s games will mark the 27th and 28th games played in Mexico since 1992, and that figure will increase to 32 by ’20/21. New Orleans Pelicans are in discussions with free agent center Jahlil Okafor on a possible deal. Philadelphia 76ers report the injured to the left foot of Sixers rookie Zhaire Smith has revealed a Jones fracture. The G League has twenty-six NBA teams that have their own G League squads in 2017/18, and a 27th will enter the league in 2018/19, with the Wizards introducing Capital City Go-Go, their new NBAGL affiliate. Today, the franchise issued a press release announcing that Pops Mensah-Bonsu will serve as the Go-Go’s first general manager, while Jarell Christian will be the team’s head coach.